We can accommodate up to three classes at a time (60 people total, including children and adults); two classes are preferred. If you bring three classes, one of the classes will have to divide in half. In order to have time to explore areas not on your tour and to have a picnic lunch on property, it is recommended that you allow 2.5-3 hours for the field trip, not including travel time. The guided portion of your field trip typically lasts 60-75 minutes. Homeschool Groups: We welcome you to register for field trips. If your homeschool group includes a range of ages, please review our complete program descriptions below and select the program that best matches your group’s grade level and knowledge base. What’s your wingspan? Are you bigger than a hawk, but smaller than a pelican? Find out the answer to these questions and many more as we learn about the feathered friends that fly all around us. We’ll also learn how to use binoculars to spot birds here at Naples Botanical Garden! What do butterflies, grasshoppers, and mosquitoes all have in common? They’re all insects! In this program, we’ll learn what all insects have in common, find out why bugs are so important, and investigate insect life cycles up-close. Through flowers, leaves, and more we’ll explore the kaleidoscope of colors you can find growing in the Garden! Together, we’ll take a “color hike,” find out how to extract color from flowers, and create a beautiful nature mandala for all of the Garden’s visitors to enjoy. What does a plant need to survive and grow? How do we take care of all the different plants at the Garden? In this program, we’ll find out what it means to have a green thumb as we learn about gardening and pot up a plant to take home! The Vicky C. and David Byron Smith Children’s Garden is an enclosed garden featuring the Pfeffer-Beach Butterfly House, which is home to a variety of native butterflies; an horticultural area filled with flowers, herbs, and vegetables; and the Wild Florida Trail, showcasing mini-replicas of ecosystems that are unique to our region. 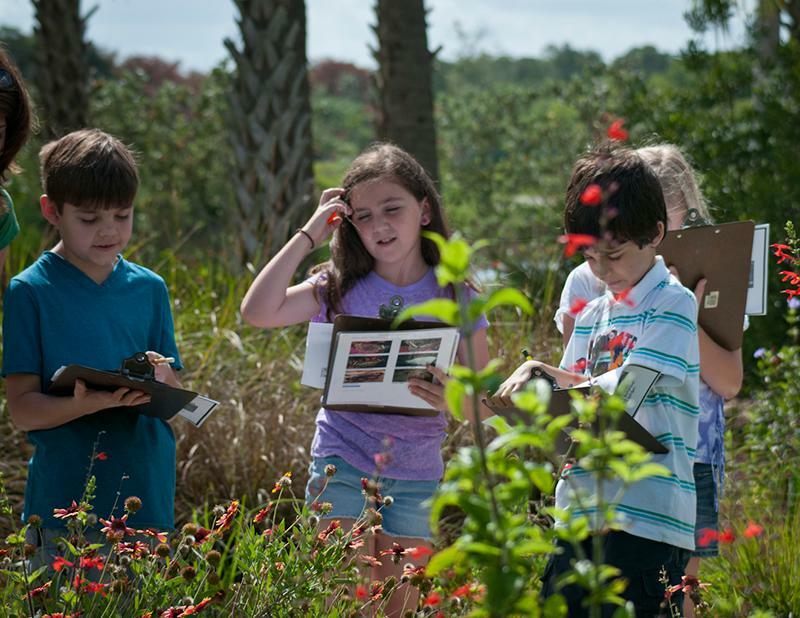 In this program, children will explore southwest Florida habitats, learn about gardening, and enjoy a guided butterfly program. Can you have plants without dirt? Can you have food without plants? In this program, we’ll find out how dirt did make your lunch and also discover where some common lunchbox items came from in nature – even your gummy snacks! You’ll also have the opportunity to pot up a plant to take back to school. Southeast Asia and the Caribbean might be on opposite sides of the globe, but they have more in common than one might think. For example, both are comprised of numerous islands and archipelagos, which presents certain challenges to the people who call those islands home. Today, students will put on their thinking caps, imagine what it’s like to live on an island, and find out how they can use the plants around them to survive. Students will also learn about the interconnected stories of the plants that were traded between the Caribbean and Asia. Did you know that Naples Botanical Garden grows food in nearly every part of the main gardens? In fact, some of the food grown at the Garden is used in our own Fogg Café! In “Plant to Plate,” you’ll learn about the different edible plants we grow from around the world beyond those that are found in our traditional vegetable gardens. You’ll also get to pot up an edible plant to take home. If your school has a garden program, “Plant to Plate” is a great way to dig deeper! A public garden like ours requires a range of jobs as diverse as our plant collection! From ticketing to gardening and teaching, fundraising, collecting, and marketing, explore the wide range of employment opportunities available in public horticulture. Students will engage with representatives from various segments of the field and gain insight to the skills and education required to have a career working around plants. Sow the seeds for a fruitful future and find out what is to love about a plant job! An adaptation of our popular “Island Explorers” program for older students, “Tropical Topics” investigates the challenges that come with tropical island living – it’s not all beaches and coconuts! Through exploration of the rich landscapes of the Lea Asian Garden and Kapnick Caribbean Garden, students will discover how plants have always been critical to human survival. Students will also learn more about the biodiversity of this region and how the Garden is working to conserve tropical plants. From food to shelter to medicine and more, plants are certainly not optional! The Vicky C. and David Byron Smith Uplands Preserve features over 30 acres of pine flatwoods and coastal scrub. Boasting the highest natural elevation on the property, the rare scrub habitat is home to a community of nearly 50 gopher tortoises. These threatened animals, as well as hundreds of other species, depend on the native plants of the Uplands to survive. But what if the Garden had the opportunity to sell the Preserve to a developer? Landowners in our area face decisions like this all of the time. In this program, students will recognize some of the difficulties community leaders face in balancing development and conservation. While exploring the Preserve, students will learn about the potential impacts development can have on a local economy and environment, and then participate in a mock town hall meeting where they debate the Preserve’s fate. Join us for a sensory exploration of the Garden! Students will use their five senses to observe and interact with the Garden, deepening their connection to nature and enhancing the vocabulary used to describe their experiences. Touch, smell, taste, see, and hear your way through the Kapnick Brazilian Garden, Kapnick Caribbean Garden, and Buehler Enabling Garden. The big question is – can the plants sense us, too? Using a map of the gardens, teachers and chaperones can lead students through the Gardens of your choice. This option allows teachers to customize their visit to suit their needs and to have a more flexible schedule. The Self-guided Tour is led by your teachers and chaperones, but Garden Docents are generally available throughout the Garden to answer any questions you might have. We recommend that children bring a notebook or journal for the Self-guided Tour, and are given an assignment that is related to the lessons you are teaching in your class.